Are you craving a drink that is just a little bit different? Trying to brainstorm where to take you interstate friends that displays Canberra in the best light? Or want to curate a list of venues to take the girls to on a hen’s night? Well you’ve come to the right place. For this week’s Five to try, I’m going to let you in on my list of my favourite cocktail places, all in within the bounds of the city centre. I love a good themed bar. 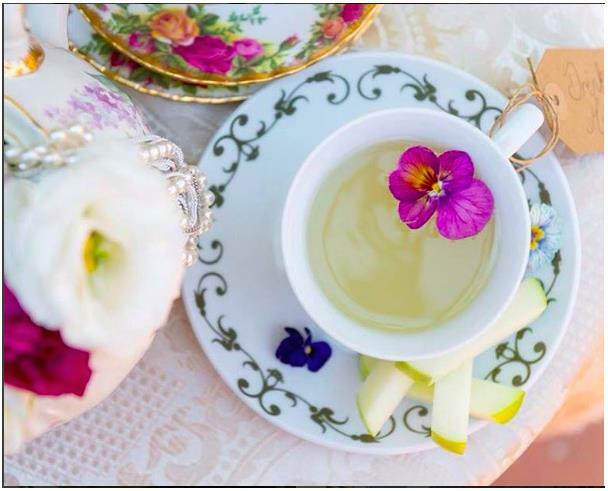 White Rabbit is Alice in Wonderland themed — to the very tee (or tea cup). Make sure you look to the ceiling as you enter, and you’ll see a ‘hole’ in the roof, with virtual clouds drifting above you. The light is low and the decor black and white checkers. There’s mad hatter tea party nick-knacks on the shelf, and of course the cocktails are named after Alice in Wonderland characters. This is basically as close as you’ll get to falling down the rabbit hole. 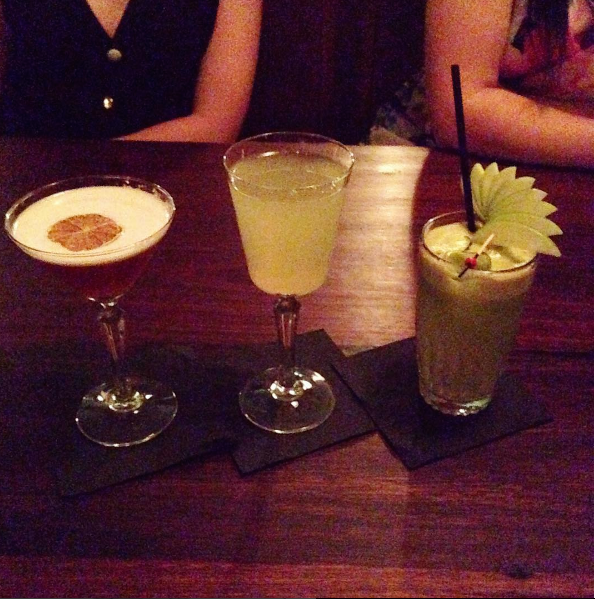 Presentation of their drinks is exquisite: think lots of nanna crockery and fruit garnishes. My recommendation is to try The Dodo, a fluffy and sweet gin-based cocktail that tastes a little like magic. The Highball Express is your one-stop shop for Cuban fun and flair. This bar is named after an airplane, which flew Americans to Cuba during prohibition, where they found themselves in exotic beverage heaven. Here, you too will find yourself overwhelmed with excellent liquor and punch choices. There’s often live music playing and somehow they’ve found space to fit a dance floor. I particularly love all the spaces at Highball; some benches on the balcony for people-watching, and a private little room for groups. The guys at Highball Express also run cocktail-making classes, which I haven’t tried, but I’m certain would make a great start to your night out with the gang. From my experience, The Highball Express is always bustling, so if you have a large group, make sure you book ahead. Molly isn’t somewhere you just find yourself: you have to make a conscious effort to go there. Hidden away in a back door off London Circuit, this is a 1920s-style speakeasy; and it’s cosy and intimate. 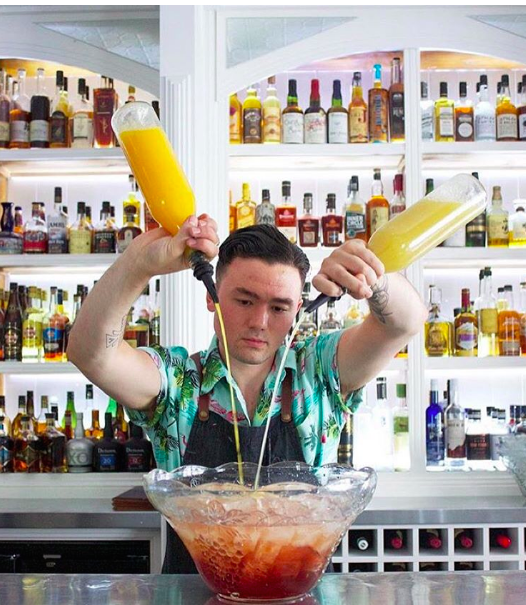 The staff are genuine cocktail experts and make a big deal about their mixology process. Watching them at work is half the fun: there’s often something aflame and many extravagant garnishes. My favourite place to sit is the booths along the wall, where you’ll forget that you’re in the 21st century, and be taken back to a time when all your worries are afar. And don’t forget to order a cheeseboard while you’re there. Molly also do special occasion packages that are worth looking into. Honkytonks (top image) is the least transportative bar on my list, but still offer a great atmosphere and great drinks. Honkytonks is a busy bar in Garema Place with lots of craft beer, great bar food and even a gallery wall of awesome art. These guys make great cocktails and serve some in jugs, for a really reasonable price. For winter I recommend the red wine sangria, but they also have options like refreshing tequila cocktails for those warmer days. 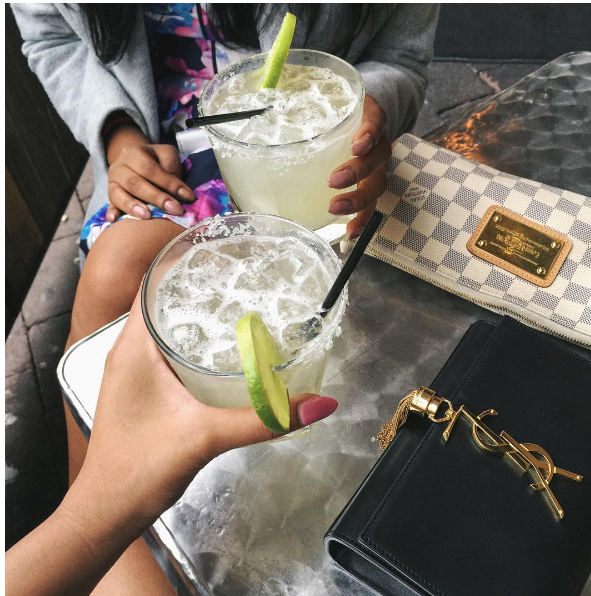 Drinks packages for groups can be arranged, which I highly recommend for your hen’s party or similar event. Hippo Co is right next to Honkytonks, so it’s the logical next step. Self-described as an old-fashioned bar, you’ll often find a jazz band (Wednesday is jazz night) or the likes playing here of an evening. Again, it is just a lovely atmospheric space to find yourself in. I dream of a wall of spirits like the one at Hippo. 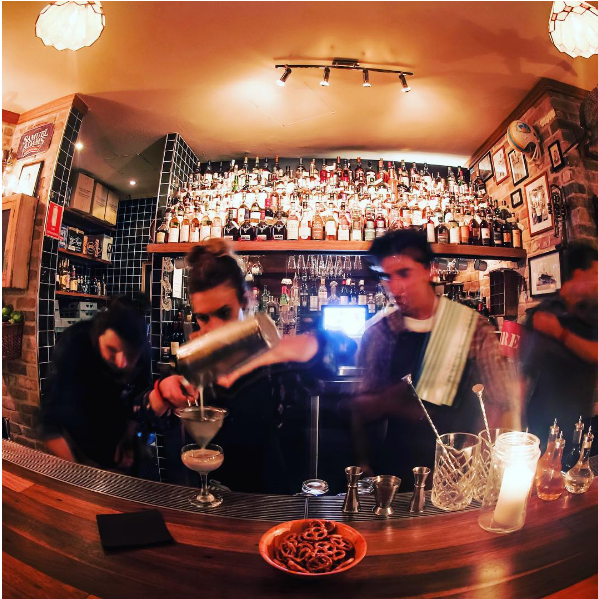 The cocktail range is extensive, and generally full of names you haven’t heard of, but if there’s a classic you’re after, the friendly staff will certainly whip it up for you. I particularly like the way that the cocktail list is categorised: into sweet, sour, refreshing and stirred. Whisky is Hippo’s other specialty, and they do tastings and cocktail masterclasses as well. If you’re going to Highball Express make sure you get a mouthful of Ron de Jeremy. Yes it’s a rum and not a bad rum at all. Also if you want the cocktails but not the $100 cost, try the Hellenic club in Civic. That sounds like an expensive night, roughly $100 for 5 drinks? Good golly, Molly’s moving on!